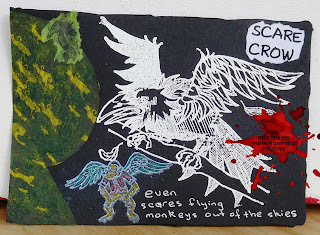 Dream In Darkness: Day 11 31 Days of Halloween~Cor stone the crows!!! 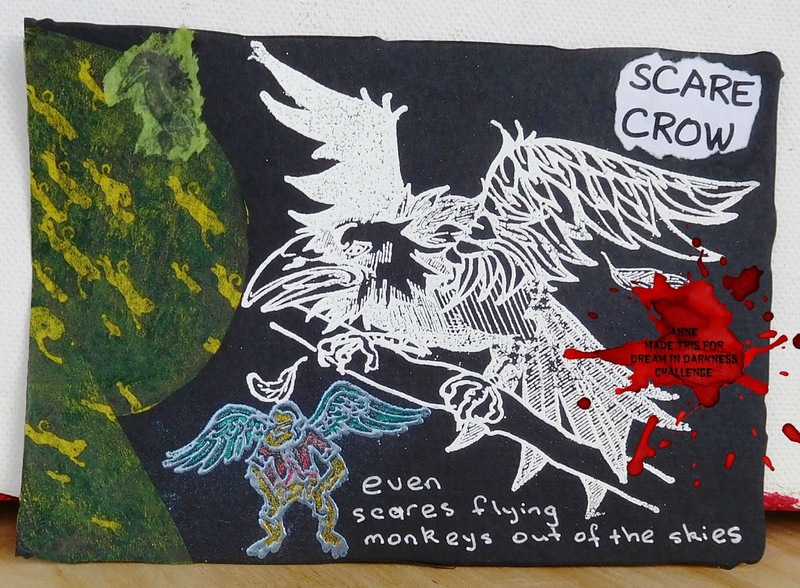 Day 11 31 Days of Halloween~Cor stone the crows!!! Welcome to Day 11 of the 31 Days of Halloween! This is an annual Smeared Ink event and we are so thrilled to be playing along as Wicked Bloggers. The Wicked Blogger challenge is to post a new creation each day during October that contains a stamped image, digi or rubber! Check out all the rules and prize details at Smeared Ink. What has CT Anne created for us today, something cute for sure! Nope - Crow's Revenge more like! Between that "Not my Monkeys Not My Circus" meme and some postcards on an alien theme, the brain's been buzzing, the table filling with trialled ideas. And Halloween approacheth. Instead of cutting rectangles 6" x 4" for postcards, the sizzix suitcase die gives a similar size but more interesting (subtle) edge. AND it gets through mat board nicely. A picture framer in our small city is always happy to give away the discarded inners or offcuts from mats she's made to frame other peoples' pictures, so I pop in there once in a while and gratefully accept whatever she wants to offload. Worth asking in your town. Anyways, this Awkful Raven stamp from gone *sob* Third Coast rubber stamps has a lot to say, especially at this halloween season. The first postcard it was stamped onto lime green paper & fussycut. The second was stamped onto the black matboard and heat embossed in white. The clown was clear heat-embossed on white paper, then blue-gold Lumiere paint washed over. The small crows look pretty happy that the clown is getting its come-uppance. 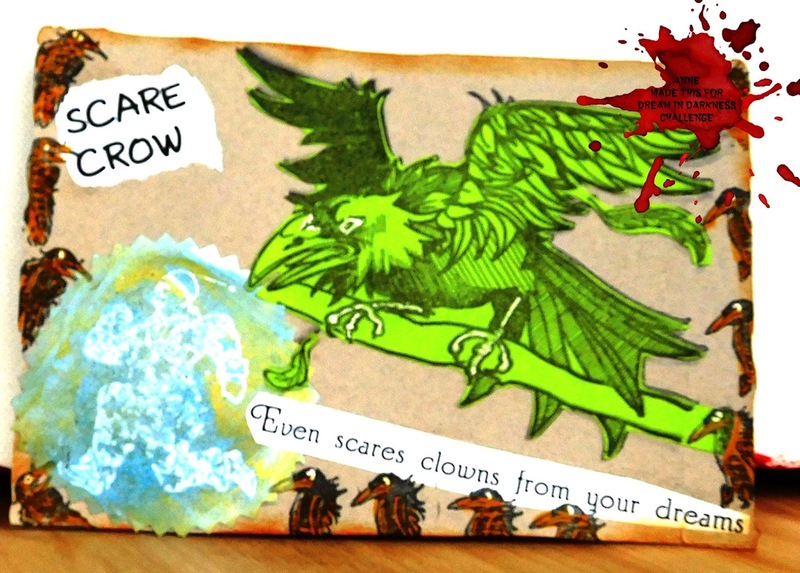 http://www.silvercrowcreations.com/ for a huge selection of crow stamps. Alas the running clown has nothing stamped on its mounting block, and I got it second-hand. Just watch out next time someone talks about scarecrows in the pumpkin patch, they might not mean those trad straw-stuffed humanoid things! Both are awesome but do like the green grow with running man more, great job as always from the Kiwi land. Two great projects, and images! Creeptastic to say the least, love today's offerings! Love both postcards but think the second is my favourite! The sentiment has me laughing. I do love flying monkeys. I would not have thought about doing a negative image. Cool effect. that is one ferocious looking bird - no matter which color you used. I've heard of so many companies that had stamps used in this hop and that are no longer in business - seems a shame. Both are cool projects!!! I too love the flying monkeys!!! What great compositions! Thanks for sharing! Great postcards! Love that running clown stamp--I always find clowns creepy. Day 6 31 Days of Halloween Got Coffin? It'a Heeere! The 31 Days of Halloween is Here!